Frankfurt am Main is among the 5 biggest cities in Germany. 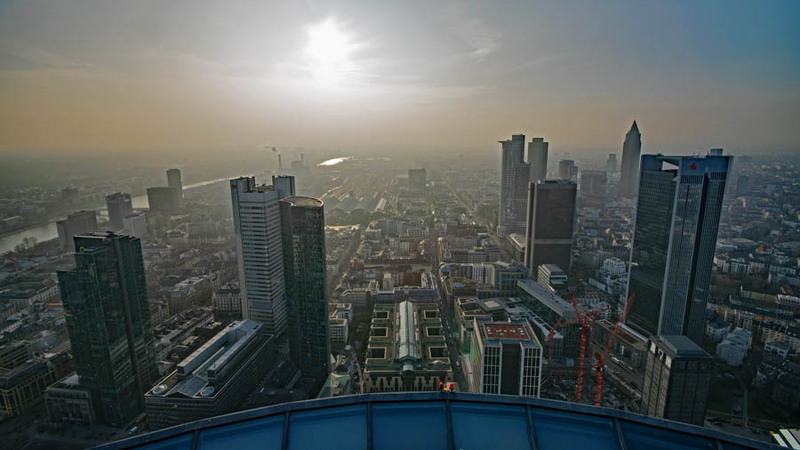 Thanks to its international stock market and business centre, it’s also referred to cleverly as “Mainhatten”. However, it’s far more than just a financial hub. 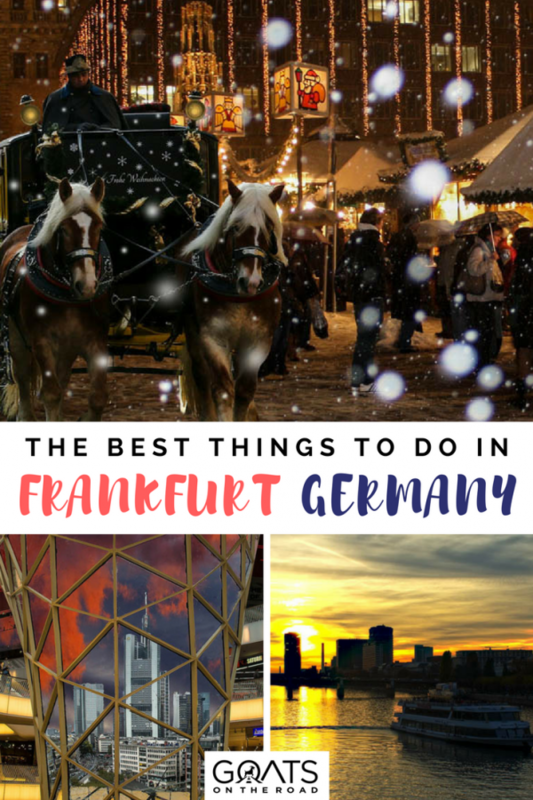 In this post I’m going to tell you how to plan the perfect trip to the city, including 12 things to do in Frankfurt that you shouldn’t miss! 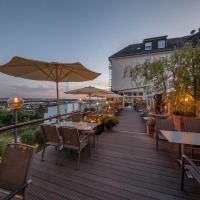 Frankfurt is a relatively easy city to navigate and with excellent connections by air and land, it’s not difficult to plan a visit here from pretty much anywhere in the world. 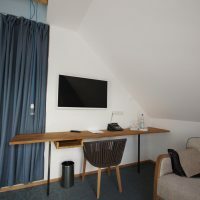 But there are a few things to note before you head to the city and some things you may want to keep in mind while planning your trip. Frankfurt is a city that his home to numerous celebrations throughout the year including the Festival of Stoneware, Day of the Forest, Night of the Clubs, Festival of Light, Skyscraper Festival, Museums Riverbank Festival and more. It pays to check the dates of these festivals for a couple of reasons. 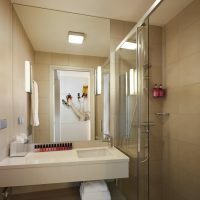 For one, the city can be packed at these times and the price of accommodation can go up considerably or be fully booked. If you’re not interested in seeing the festivals, perhaps plan your trip around them. If you are into festivals, then Frankfurt is a great place to experience them. Check the dates of festivals and events in the city and try to be there for a celebration. 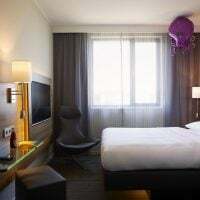 Because Frankfurt is one of the most visited cities in Europe, you’ll find that it can be quite busy, especially on weekends and public holidays or during festival times. 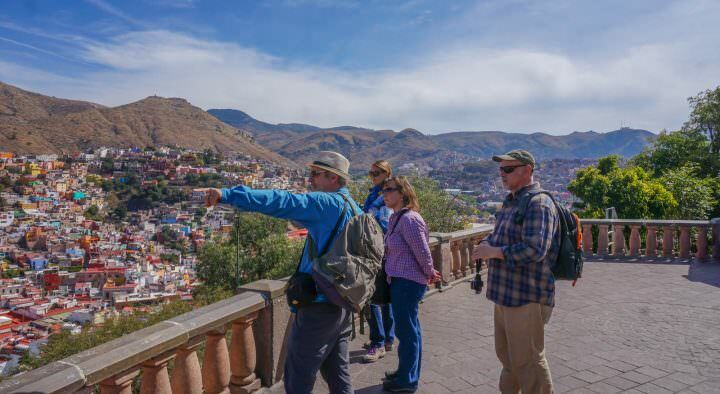 At these times, it can be difficult to book tours and you can sometimes wait in line for hours to access the main sights. Even on a regular day in the city, you may stand in line for an hour or more. 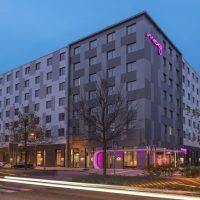 TripVerse has an excellent list of things to do in Frankfurt and in many cities around the world. They also offer skip-the-line tickets to many of Frankfurt’s main sites. So if you’re reading this post of the best things to do in Frankfurt and you’re not interested in waiting in long lines and wasting your day, you can check them out. 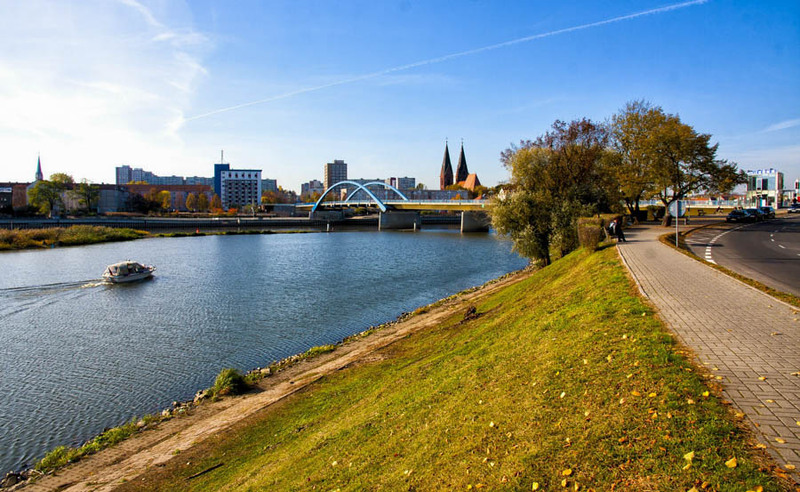 Frankfurt is typically characterized by a temperate oceanic climate with the average annual temperature hovering around 10.6°C with summers reaching around 25°C and the coldest temperature not often going below 0°C in January. The best time to visit the city is between may and September, but again, this may change depending on what festivals you wish to see or what kind of climate and activities you’re seeking in Germany. This historic square is situated in the heart of the old town and had to be completely reconstructed after the bombings of World War II. As iconic as the gabled houses that frame the Römerberg, is the Fountain of Justice (Gerechtigkeitsbrunnen) which is an ancient well built in 1612. It shows the four human virtues of justice, hope, moderation and love. 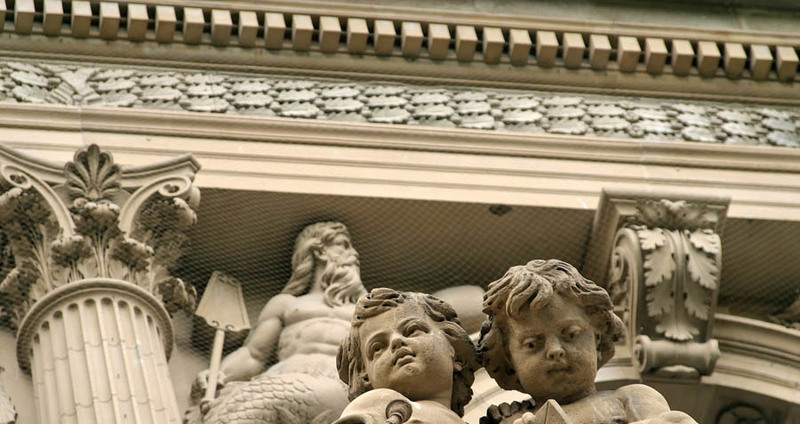 Small female statues on the side of the wall represent each virtue. Watching the crowds wander around the square while enjoying a coffee in one of the cafes is one of my favourite things to do in Frankfurt, especially in the summertime. 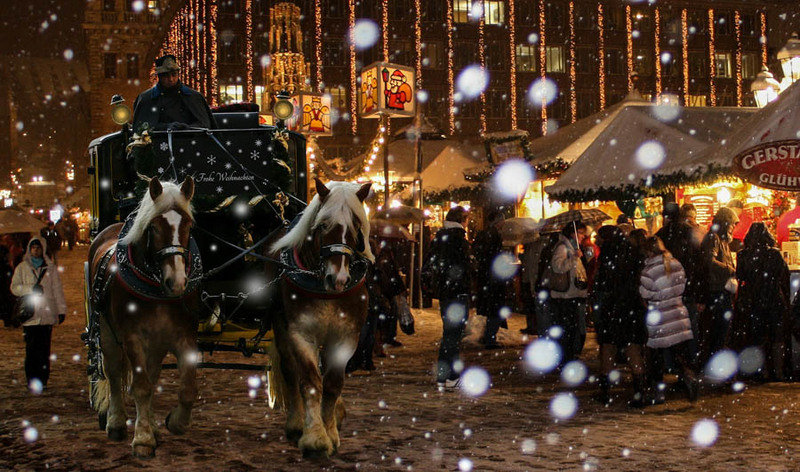 In December, the square is home to a lovely traditional German Christmas Market. This is the best place in the city to get yourself in the mood for the holy night. Christmas Markets in Germany are something special. Definitely try some Roasted chestnuts and mulled wine while listening to the sound of perfectly cheesy Christmas music. You’ll soon understand why Germans love their Christmas Markets more than any other event of the year! At 259m in height, the Main Tower is the fourth highest building in Germany. 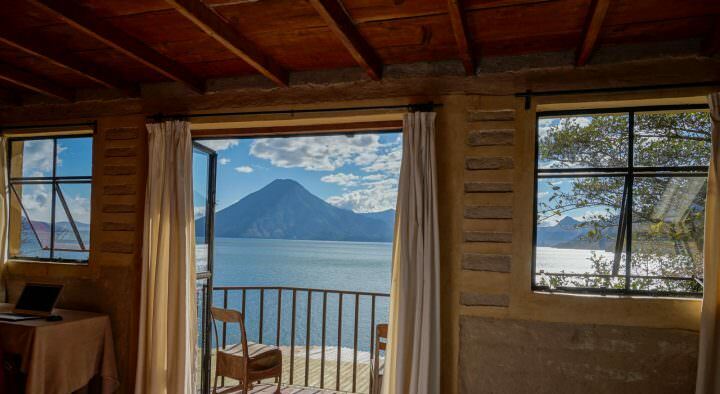 It provides visitors with fantastic views over both the city and surroundings. Climbing the 198 metres to the visitors platform can be challenging for those afraid of heights. 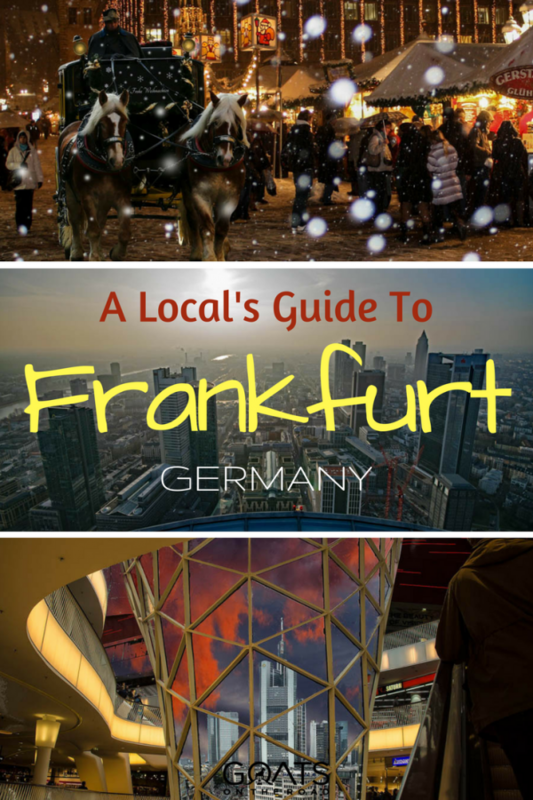 But it is certainly worth it for the views and is one of the top things to do in Frankfurt. Stunning Views from the Main Tower. A single ticket is €7.50 ($9), or €5 ($6) for students. They can be purchased online through TripVerse if you prefer to save time on long waiting hours at the tower’s base. Everyone knows that Germany has some of the best beers in the world. However, the Hessian regional drink Ebbelwoi is a refreshing alternative to quench your thirst and sampling it is one of the best things to do in Frankfurt. Ebbelwoi translates as “apple wine” and at 5%, it’s low in alcohol…and calories. People also sometimes enjoy it warm during the cold winter months. 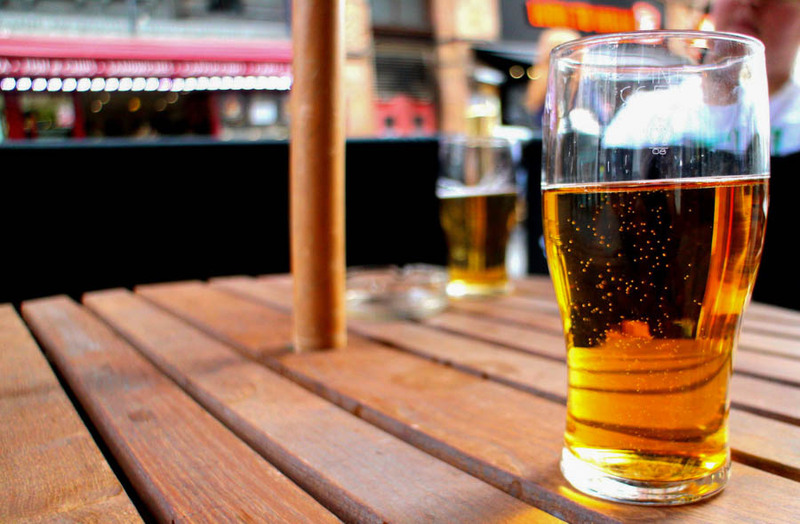 The apple wine, which is less filling than beer, can combine perfectly with a traditional German meal. Try it with something like pork ribs and sauerkraut with potatoes. I recommend the Ebbelwoi Unser or the Apfelwein Dax for some authentic German cuisine and and an exquisite taste of the Hessian regional drink. For a change in perspective, take a look at the impressive skyscrapers from the water. 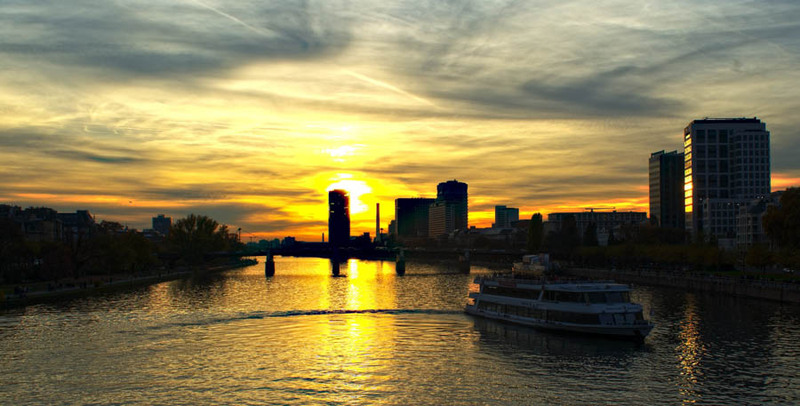 This is one of the best things to do in Frankfurt for sunset. Depending on the length of your boat ride, you can buy tickets €10 – €13 ($12 – $15.50), with 20% off for holders of the Frankfurt Card. After purchasing a ticket at the tourist information or ticket counter, you can sit back and relax on the spacious deck. Alternatively, check out the air-conditioned indoor facilities while contemplating the impressive urban architecture of Frankfurt am Main. The Primus-Linie offers a tour for every occasion, taking visitors on stunning sunset-tours or a beautiful Sunday brunch on the water. Spread out on both sides of the river bank, this stretch offers a variety of cultural exhibitions. These include both the historic Jewish Museum and the Museum of German Architecture. For rainy days, I recommend buying the Museumsufer-Ticket. With this you can check out all permanent and temporary exhibitions in the area for 2 days and it only costs €18 ($21.40). The Museumsufer is especially nice in summer. 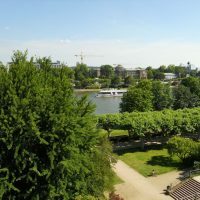 Some of the other best things to do in Frankfurt for culture fanatics include the Nacht der Museen (Night of the Museum) in Spring and the Museumsuferfest (a cultural festival by the river bank) in August. During these festivals, people of all ages wander through the different exhibitions and enjoy food and drinks by the water. 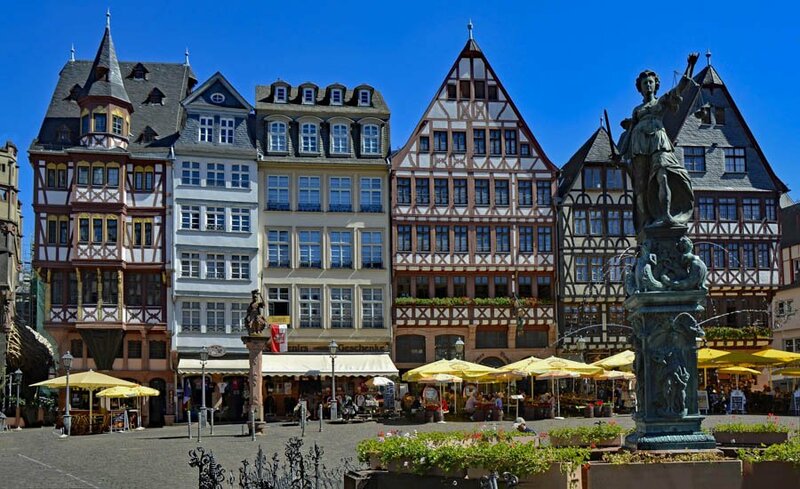 Frankfurt has more than one shopping district, but the Zeil is the oldest and most popular one. In early centuries, owning an apartment in this street was considered a symbol of prestige for wealthier families. There is nothing you won’t find in one of the countless shops and designer stores along the Zeil. This is probably the reason it’s one of the highest revenue shopping streets in Europe. It’s also why shopping ’til you drop is considered one of the best things to do in Frankfurt. 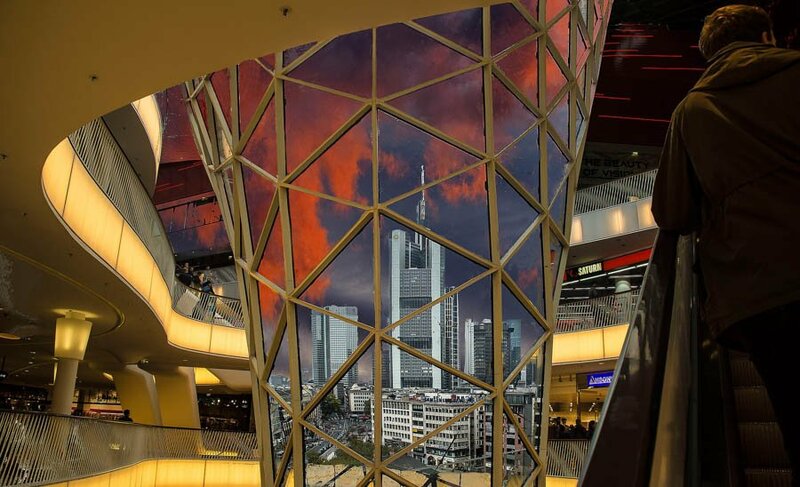 The futuristic building of the Zeil in Frankfurt. The futuristic building of the Zeil Gallery has 7 stories and a rooftop restaurant with outdoor terrace from where visitors get a perfect view of the city. 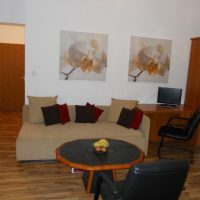 Here is a list of the top 3 rated, affordable properties in Frankfurt. Click on the links and check them out for yourself! The House of all Germans played an important role in German history and is associated with the foundation of German democracy in 1848. You can visit the church everyday between 10am and 5pm for a wander through the aisles and a journey back in time. It won’t cost you a cent, so is one of the best things to do in Frankfurt for free. Today, the Paulskirche also functions as a public space for exhibitions, memorials, and as a meeting place. The Kleinmarkthalle has everything you would expect from a traditional German food market. 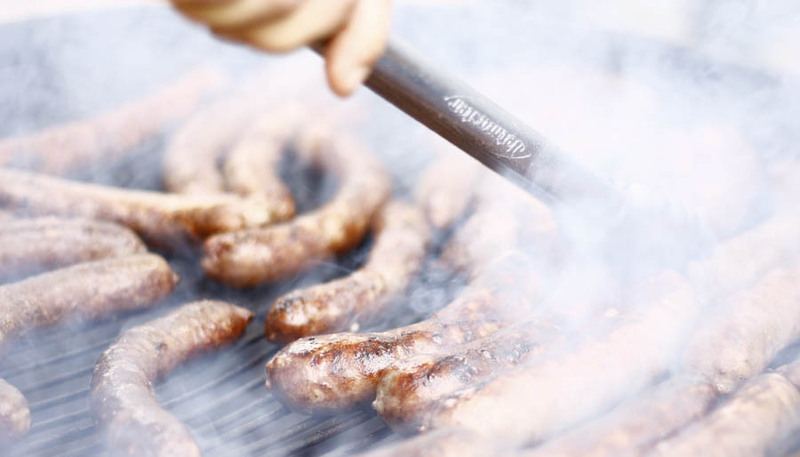 The aromatic smell of smoked sausages, roasted nuts, pretzels and sweet German pastries lure the visitor from one stall to the next. Grab some delicious street food or fresh ingredients for a picnic to go before you continue your city tour through Frankfurt. You could also finish off a long day of walking with a glass of wine on the outdoor terrace of the market hall’s upper level. The Kleinmarkthalle is open weekdays from 8am to 6pm and Saturdays till 4pm. The Goethe Tower is 43 metres high and – once you have conquered the steps – you’ll be rewarded with stunning views of the so-called Green Belt of Frankfurt. The Tower is surrounded by 3 hectares of playgrounds with slides, swings, and even a water-park in the summer. No matter if you are coming to the Goetheturm for the view or to have your kids entertained for a couple of hours, the relaxing atmosphere in the park is a nice change to the urban city vibes. Missing out on the Opera House in Frankfurt would be to ignore the cultural highlight of this city, it’s most definitely one of the top things to do in Frankfurt. This impressive, historic building was bombed completely during World War II before being reconstructed in the 1980’s. The Old Opera House by night. 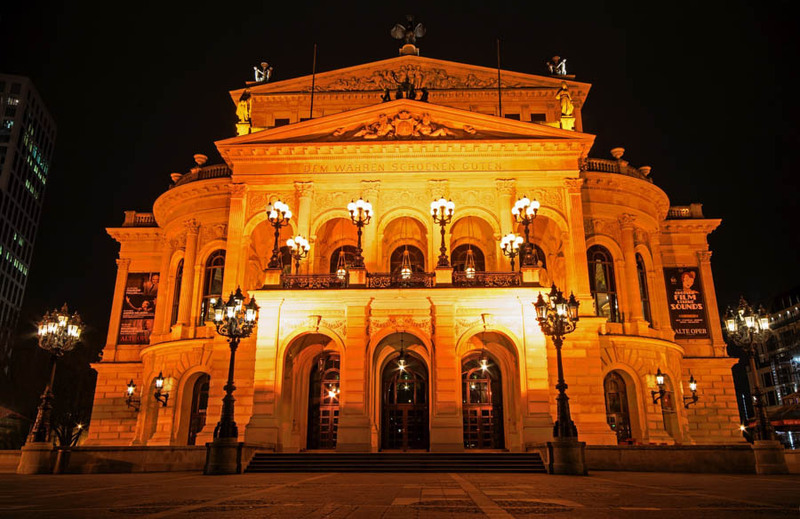 Today the Opera House is not only considered an important part of Frankfurt’s historic heritage, but presents a variety of contemporary and classic music concerts in its spacious hall. Tickets can be purchased online, but even without attending one of the concerts, the Old Opera House is extremely photogenic and well worth a visit. 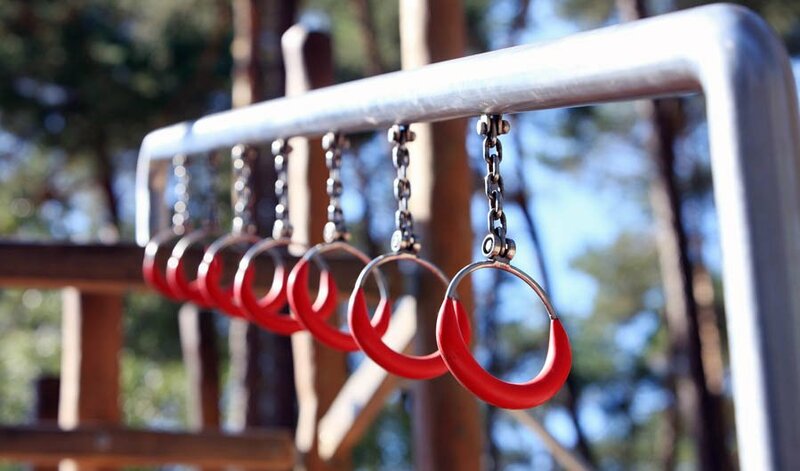 Exploring the Outdoor Museum Hessenpark is one of the best things to do in Frankfurt if you have kids or family. The village reconstructs life in rural Germany during the 18th century. It contains farm houses, shops, a traditional bakery and a mill for brewing beer. 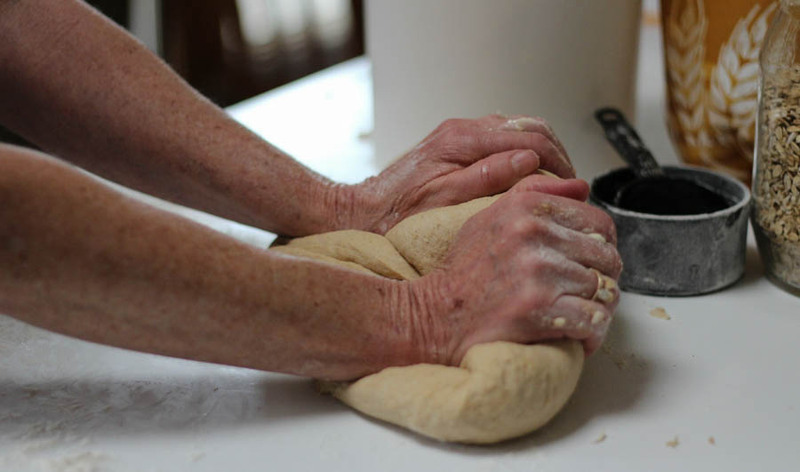 Learn how to bake traditional German bread. Adults pay €8 ($9.50), or get the better value family card for €16 ($19), to spend an exciting day on the tracks of German history. Students and kids from the age of 6 get in for only €2.50 ($3) and there are exciting handicraft workshops on offer several times a week. 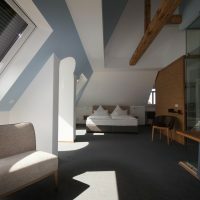 Looking for something different to do in Frankfurt? This city is popular for a diverse offering of Escape Games. They’re not only entertaining for locals, but can be a playful way of spending a rainy day for visitors. Escape Games can be booked with larger groups of 7+ people and are usually set up around a crime story. The group is then challenged to detect and solve individual puzzles linked to the final story. You will have to purchase your ticket for a 60-minute play online and can expect to pay between €20 and €30 ($24 – $36) per person. Choose between the different themes such as the Jail-House-Escape or Black & White, depending on your preferences and begin! Frankfurt is often thought of as the financial capital of Germany. Businesses choose it for its central location within Germany and Europe, its airport and the flourishing stock exchange market. 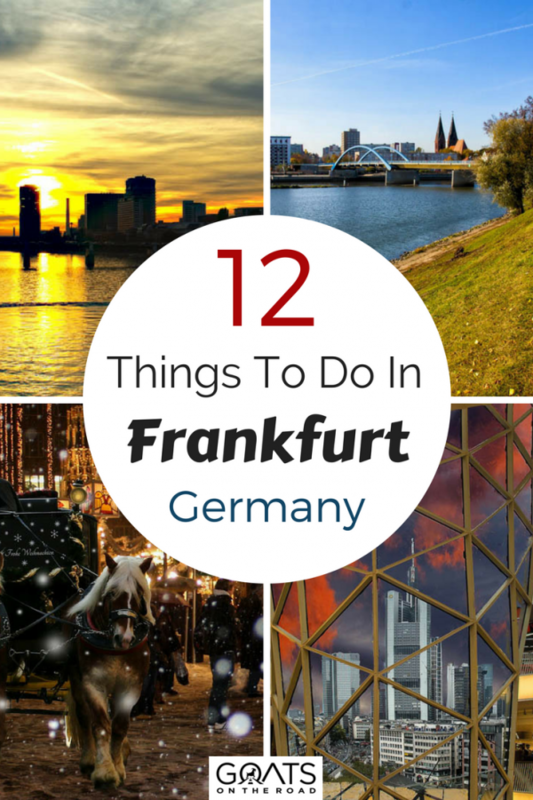 There’s a great selection of cool things to do in Frankfurt. For millennials and students, the city has the perfect mix of style and innovation, chic restaurants, cafes and a vivid nightlife. 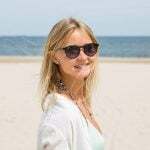 Nellie caught the travel bug in Australia in 2013 when travelling and working her way around the continent. After studying culture and tourism for 3 years, she decided to dedicate her life and work to exploring of new cultures and places and to share these experiences with others. 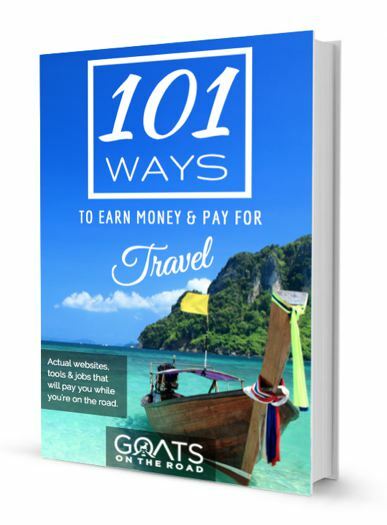 Nellie and her favorite life and travel partner Greg are working as Freelancing Content Creators in the tourism industry, following their dream to maintain the Digital Nomad Lifestyle, see the world and share their passion for travelling with their audience. Follow Nellie over at Snell Media and on her social media channels below. 10 Offbeat Museums in Germany You Won’t Want to Miss! Great post. This looks awesome pictures in your post. Thanks for sharing it. Looks like a great place to go on vacations! 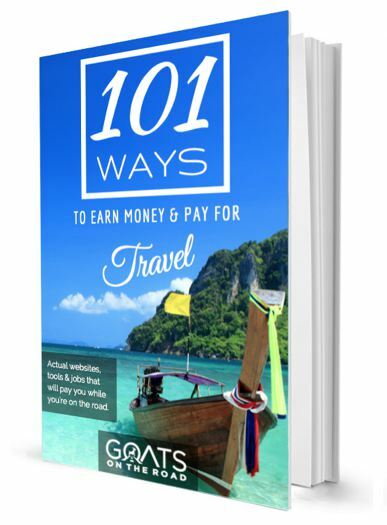 I’ll see if I can plan my next trip there!